Never Settle - 5 reasons why One Plus's tag line has me in awe since ages. 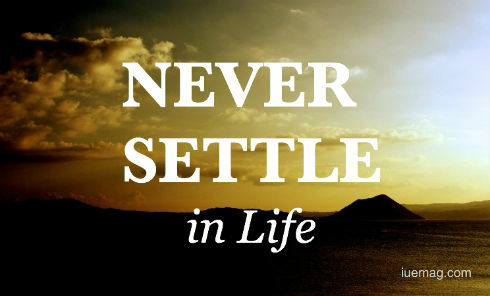 When I got my first One Plus phone (which was One Plus One by the way), I was intrigued and amused both at the same time with their "Never Settle" tag line. Years later, when I'm well after One plus's time and just into the iPhone maze, it still doesn't stop intriguing me. To the extent that I dropped an article which I had already started writing and got to this instead. I actually wanted to talk about never settling as a sub-point in that article, and quickly realised there was no way one single point in an article would be enough when the subject was "Never Settle"- I would need a whole article worth of word space for this- and here we are. Never Settle - at any place. Which would mean be a traveler for the rest of your life. Live like a vagabond, a gypsy even. (Gypsies, those travellers whose lives I dreamed of living thanks to Enid Blyton. Their caravans painted more than a pretty picture, the idea of going town from town, never settling seemed like THE kind of life to live! Years later, for a homebody like me, it is literally something that pushes me out of my comfort zone and puts me into another zone which I can never quite describe with words. Never Settle - for an offer that doesn't appeal to you. Our life itself transforms when we accept our life situations, but when we have a choice to make about what to pick, never settling for something that doesn't hold that appeal- not just on a surfacial level though! When you're approximately at the same frequency as something, you may strike a chord. If you're resonating at the SAME frequency, the results can surprise you! Never Settle - for a price you believe isn't your worth. In daily life, I see people time and again Settle for lesser than what they deserve, out of fear. When you know your worth, you ought to be clear. It's very important to know your worth (with respect to the work you offer only), however! When you say yes to something, make sure it's a whole resounding YES. Life is too short for anything else. Never Settle - for a partner who you believe you're "settling for". An aspect of life which is by far probably going to be the most influencing and important decision of your life, should be addressed with as much sanctity as anything else, if not more! Never Settle - just in life. Most people I know use the phrase "I'm pretty settled in life" when they want to indicate they're in a comfortable state in their life, their life is pretty good and they're happy with the comforts they have. It takes some courage to be truly unsettled, to live outside that zone of comfort, and still enjoy it. Always unsettled is too far off a question- even as I write it I have a thought, what if your radius of comfort is SO huge that to unsettle you would need a different kind of test altogether? The goal of course, is to have that kind of radius of comfort in the first place! Here's to all things unsettling, here's to growth. Cheers!